Next litter expected late May. Check back on litter page for more details. 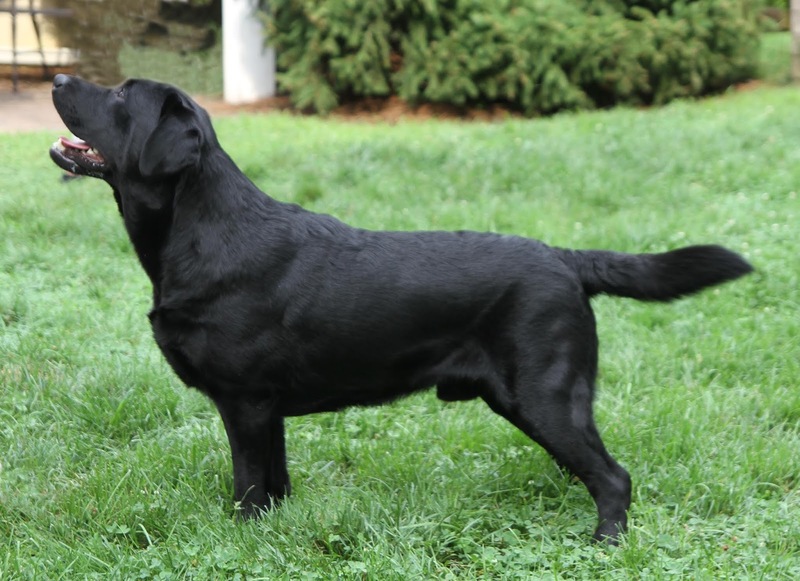 Pondview Hawksmoor Wynter of Wellington CGC TKN "Wynter"
If you would like to be on an approved wait list for a future puppy, please email with detailed information regarding you/family. To be approved you need to have a phone interview. Then a meeting to meet me and the Labs is required before final approval. Please do not expect that your name is on a wait list because you emailed to request this. You MUST be approved first. Another year of Potomac, the Camelot of Labradors, is in the books. A busy week of juggling 3 crazed boys who had come off from a month of girls in heat at home and then were over the top with even more smells at the show. 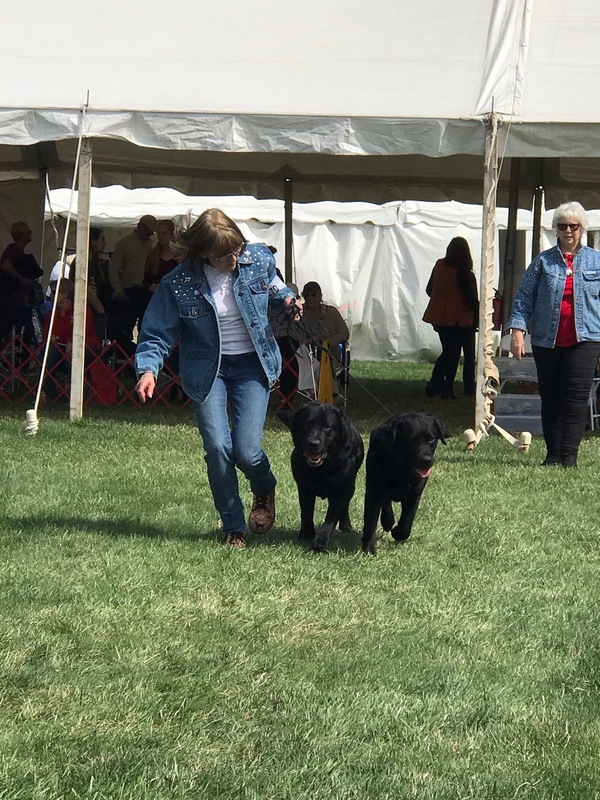 Adding my sweet 11 month old, Margaret and 9 week old Solo who was the easiest of all the rest made it challenging to sit for very long to watch all the beautiful dogs in the rings. Always great to see so many friends, from breeders, handlers and vendors that I only get to see once a year. I was proud of how Margaret showed in her huge 9-12 mo puppy regular and sweeps class. It was her first show and she handled it well. Louie and Case managed to hold it together in Brace even though the two girls behind us were in heat. It took all my strength to keep them focused and I left the ring with a 3rd place and a blistered left hand from gripping the leads. Louie looked great in his competitive Veterans classes. Wynter showed well in his Am Bred class although while waiting his turn he managed to embarrass me by yanking me down as he attempted to hump the boy behind us. Case had his moment of glory in the Parade of Titleholders, receiving his beautiful ribbon for his championship. Although he did not make a cut in Breed on Friday he showed well and I was glad to see him happy. Sometimes it is the little things that make a moment memorable . Thank you Norman Grenier, who was showing ahead of me in Group 4 and asked if Case was the dog he finished with his final 2 points. Nice to see him wagging his tail and moving well. And yes, he was happy to be with me and I was happy to be able to show my sweet boy. We also were able to accomplish Trick Dog Novice titles on Louie, Wynter and Margaret and Margaret also earned her CGC. On Friday I left Potomac and headed to Carolina Beach. The sun was setting between rain clouds as I headed east on I-40 and I reflected on the week I had left behind. There is something humbling about being at Potomac. Every dog there is a winner. Many congratulations to all those who placed. I feel blessed to be a part of it all.